Just three hours from London (and at this time of year, no time difference), it is a land of true extremities – fjords, lava fields, bubbling mud pools, erupting geysers, active volcanoes and glaciers. Thanks to its location on the Mid-Atlantic Ridge – the dividing line between the Eurasian and North American continental plates – Iceland is a concoction of geological formations. Intense, dramatic and colossal: this country is strikingly beautiful and packed with an endless list of natural attractions. The perfect location for a long weekend away full of unique life-time experiences. Booking Easyjet flights from London Luton gave us the best flight times possible, leaving London early in the morning for an afternoon floating in the Blue Lagoon and with a return flight after a few days in late afternoon allowing for some last minute whale and dolphin spotting. We booked all our tours with our friends at Icelimo Luxury Travel who looked after us fabulously from start to finish. 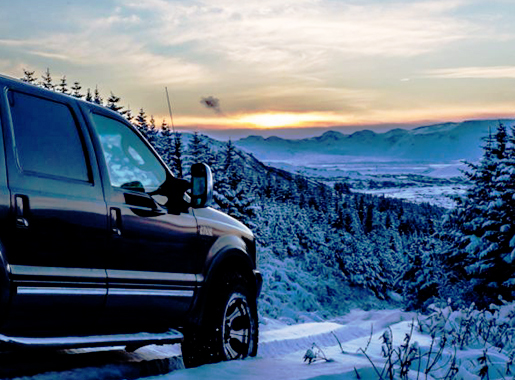 At the very start, we were met at Keflavik Airport by our guide, Gylfi, along with his monster 4×4 Chevrolet Suburban. He was there for us for the entire weekend to take us from place to place, filling our heads with amazing facts and figures about this amazing land of which he was clearly very proud of. This being a first visit – and believe me when I say you will want to return – it was important to experience and view the main points of interest…. The Golden Circle Route. First stop was Iceland´s Western Volcano belt and Hengill Volcano. And on from there was Thingvellir, which is the National Park where we found Althingi which has deep historical and symbolic associations for the people of Iceland. We continued the Golden Circle by heading to the famous Geysir geothermal area which is home to The Great Geysir and it’s active sidekick Strokkur! Although the original Geysir is not predictably active, its neighbour, Strokkur, will erupt every 5-7 minutes – just amazing to witness! So the tour continues, next stop Gullfoss, or “Golden Falls“. To stand at Gullfoss and bask in its beauty is both uplifting and breath-taking…..and freezing cold of course! The Blue Lagoon. First thing to mention is….book in advance. This is a very popular tourist destination and gets booked up quickly. 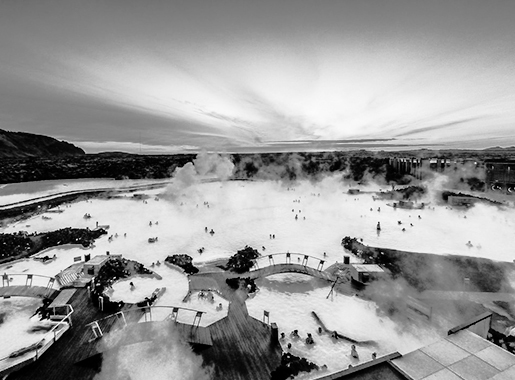 You can spend quite a while soaking in the Blue Lagoon….incredible scenery surrounded by black lava rocks and snowy peaks whilst you are drifting around in the warm milky blue waters. There are stations where you can get masks for your face, a swim up bar with smoothies, steam rooms, and even a little cave that explains the history of the lagoon. Watch the whales and dolphins. Board one of the many boats at Reykjavik’s harbour and take to sea to go watch the whales and dolphins. You do not need to book this in advance and it is not always guaranteed that you see any sea life I might add but at worst, you do get to go on an exhilarating boat trip with amazing views. The Northern Lights – the Aurora Borealis. Absolutely a must on your hit list of ‘things to do’. The official Aurora season in Iceland is from October till March but like with so many other things that have to do with Icelandic nature it’s not something you can say with any certainty. 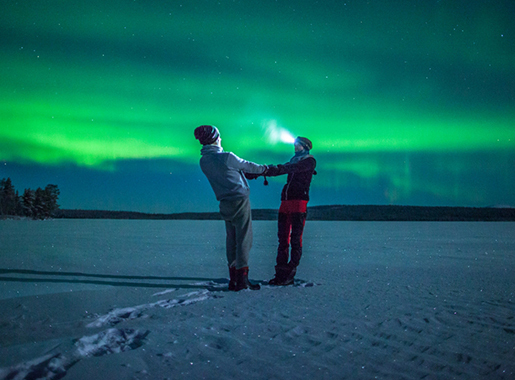 The ideal conditions to see them are when it’s cold and dark outside and the Aurora activity is high. The sky has to be clear which it usually is on very cold nights. So Gylfi drove us out into the middle of nowhere in dead of a bitterly cold night and there we stood, binoculars in hand awaiting the arrival of the Northern Lights. All I can say is that we caught a decent glimpse! Action aboard the quadbikes. You can go sledging, ride a skidoo, take a ride on one of the magnificent Icelandic horses or you can do what we did courtesy of our friends at Icelimo Luxury Travel, take a trip out on quad bikes. We chose the Twin Peak tour Sightseeing over Reykjavík with stunning views and a trip uoto the Hafrafell and Úlfarsfell Mountain summits as well as the Hafravatn Lake. There are plenty of guesthouses, Air BNB and hotels across the country, we elected to stay in the heart of town at the very cool Hotel 101, a designer boutique property close to the shops and restaurants. It all depends on your budget and where you’d like to be located of course. And the restaurants are amazing serving everything from seafood and great steak to catering for those with a more adventurous appetite where you can try puffin, reindeer or whale! Good luck with that. In all – a trip of a lifetime and something to tick off the old bucket list! For more information about travel, accommodation, tours and restaurant suggestions and bookings and to have Icelimo Luxury Travel (www.luxurytravel.is) create a tour package of a lifetime then please contact your lifestyle manager now.